What should an Eye diagram look like? Real Time oscilloscopes build the Eye using the complete waveform from a single trigger point and captured from the signal at a frequency at least 2.5 times higher than the signal. Sampling oscilloscopes build the Eye pattern from individual pixels sub-sampled at a frequency lower than the signal with position of each sample offset from the previous. These two approaches produce a subtly different pseudo-live display which the T&M equipment has processed and filtered to give the most accurate results. The Eye pattern can be shown with or without jitter superimposed. With jitter the resultant Eye can be thicker, it can have movement and it can close. With 12G-SDI the permitted jitter for some frequencies is 8UI and even at 0.2UI the Eye will close making it difficult to measure accurately. So for most purposes the Eye should be jitter-free so that the signal shape can be seen and the critical parameters of amplitude, rise time and fall time can be measured. A common misbelief with Eye Diagrams is that one display method is somehow better than another. In practice the method is irrelevant as the displayed Eye Diagram is nearly always the same and this is the important thing when making measurements. How can I gauge the quality of an SDI signal and why is it so important for 12G-SDI? The quality of the SDI signal is important as this determines the maximum cable length the signal can be sent and can be defined by the waveform shape and the jitter level. The waveform shape is different for SD, HD, 3G, 6G and 12G SDI signals. For SD it is almost a square wave but for 12G it is more like a sinewave due to the attenuation of the high harmonic frequencies of the fundamental clock frequency. Regardless of the clock rate, the most important waveform aspects are the amplitude, rise and fall times. Overshoot and undershoot are indicative of phase differences in the harmonic frequencies (normally due to return loss and signal driver quality) but as long as they are within specified limits they should not affect the overall cable length. Note that current generation, high slew rate driver chips for 12G-SDI can transmit over 60m with Belden 1694 A cable. Even with the perfect waveform shape, the level of jitter will affect the cable length because the jitter effect is accentuated with lower signal level as the signal rise / fall times are longer. It is essential to remove jitter from the Eye Diagram and monitor it separately. Omniteks Ultra 4k Tool Box employs this method for this reason. It is essential that Eye Pattern shape and Jitter measurement are within specified limits at the sending equipments output, over a 1m cable and using 100% bars as this is the best way to ensure that the signal can be delivered over reasonable cable length when actual live video is used. How do I know that my equipment is immune to Potholes? Potholes (or TRS-Induced Pathological Conditions) are long sequences of ones and zeros that can occur in the SDI data steam when the 8 data streams of the 4k / UHD image are multiplexed onto a single 6G-SDI or 12G-SDI cable. The effect of potholes is jitter, and potentially data errors, in the receiving equipment as it loses and re-locks after each occurrence. These potholes potentially occur twice in every 512 lines when the TRS preamble sequences from the 8 different streams are multiplexed. For 6G-SDI the concatenated TRS preambles result in 8 consecutive words of 3FFh and 16 consecutive words of 000h. When this is serialised, it will cause 80 ones followed by 160 zeros at the scrambler input. In the worst case scenario, after the NRZI coding, this could produce a run of 179 zeros or ones in the resultant data stream. To prevent this, a technique known as syncbit insertion is employed to stop these pathological sequences occurring. This requires the modification of the 10-bit parallel interface data stream to replaces the two least significant bits of repeated 3FF or 000 words, on all but the first set of words, with values of 10b for 000h words and 01b for 3FFh words. Not all equipment employs syncbit insertion so the use of 6G-SDI and 12G-SDI pathological test patterns available on the Omnitek Ultra 4k Tool Box can ensure that receiving equipment is immune to potholes. Which is the best Test Pattern to use with 4k / UHD equipment? Due to the construction of 4k / UHD data streams, traditional line test patterns such as colour bars and multi-burst do not always show up underlying issues. With quad link 3G / square division implementations there is a risk that cables (links) can be swapped or delayed with respect to each other which will only show up if an appropriate moving test pattern or pattern sequence is used. Ideally the test sequence should contain elements that will identify square division and 2 sample interleave artefacts as well as possible temporal issues if the individual link signals (ie quad link 3G or dual link 6G) are compressed or delayed with respect to each other. What do good Jitter meters tell me? As the clock frequency of the SDI data streams increases, the effect of jitter becomes potentially more damaging to the data. Timing and Alignment jitter at different frequencies can combine to exceed the permitted jitter level and cause data loss if the receiving equipment cannot tolerate it. Jitter meters show the Timing and Alignment jitter level at different frequencies and match the SMPTE RP 184 Jitter Tolerance Template which defines the permitted jitter level within each frequency band for each SDI interface type. Test equipment that only shows one or two frequency bands simultaneously does not give a realistic jitter measurement. Ideally all jitter frequency bands need to be monitored simultaneously. 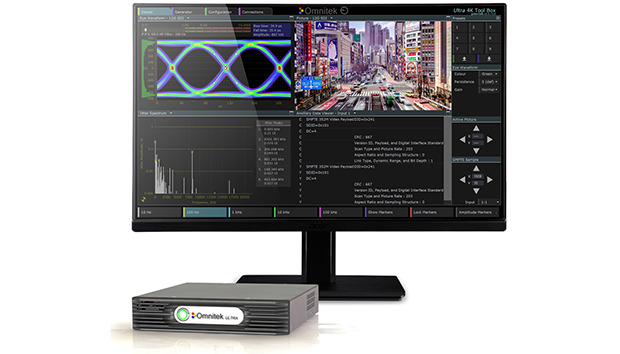 Tools such as Jitter Meters, Waveform, Histogram and Spectrum available on the Omnitek Ultra 4k Tool Box can give an in-depth view of the jitter landscape of the SDI signal. What should I be monitoring in Ancillary Data? With the increasingly sophisticated use of metadata to define how the video image is displayed, and audio is heard, it is essential that all Ancillary Data is correct to ensure that the viewer experience is as intended. Firstly the structure of all data needs to be checked using the CRC word built-in to each data packet. Secondly the continuous presence of the data packets needs to be monitored. Thirdly the content of all data packet need to be checked to ensure that they have been correctly formatted and to do this the packets need to be decoded. In the case of the SMPTE 352 packet (which defines the video format, image size, frame rate, colour space and link construction) this can be done by simply checking that the signal can be correctly decoded by the receiving equipment. For other data packets, appropriate test equipment such as the Omnitek Ultra 4k Tool Box is required to find and interpret the 50 plus different Ancillary Data packets that may be present on the SDI signal.